Ribbon Ridge Pinot Noir winery in Newberg, Oregon. At the same time, Kathleen’s parents are planning their retirement on the West Coast. There was another family connection to Oregon, too: Kathleen’s great-great grandfather was a pioneer on the Oregon Trail and played an important role in the Lost Wagon Train of 1853. The stars are aligning and a goal is set: Brad and Kathleen ring in the year celebrating the sale of Brad’s wine shop, pack their two dogs and most valuable possessions in their Subaru Legacy, and drive from Kansas City, Missouri, to Portland, Oregon. They have no house, no land, no jobs, and no plan. 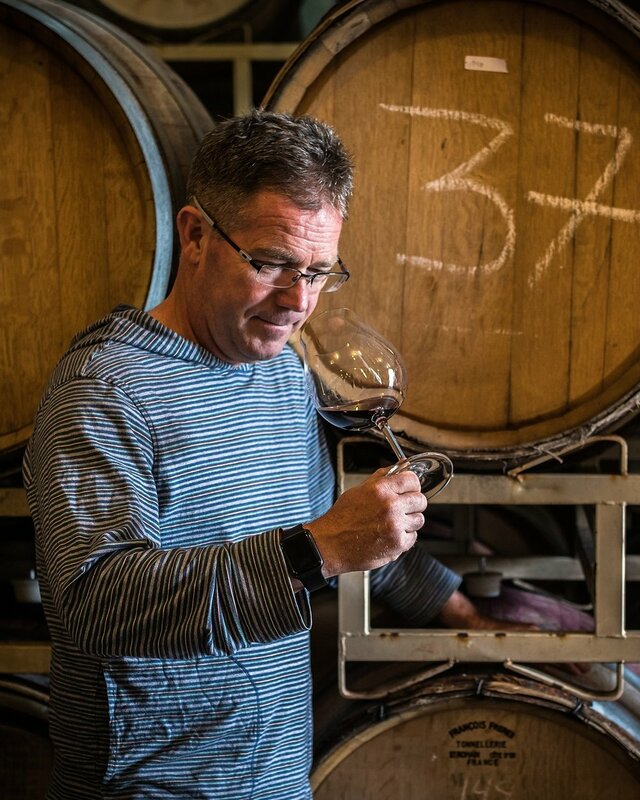 Upon arriving in Oregon, Brad begins working as a cellar hand at Domaine Drouhin. He will soon work his way up to Chef du Cave. The same year of their manifest destiny, Brad and Kathleen have the opportunity to purchase 38 acres near Newberg, Oregon, with Kathleen’s parents, Don and Carol McClure – a site that would become Ayres Vineyard and a homestead for three generations of family. The first vines at Ayres are planted – Pinot Noir clone 667. Pinot Noir clones 777 and 115 are planted in the vineyard. An experimental plot of Pinot Blanc, Sauvignon Blanc, and Pinot d’Auxerrois, as well as Pinot Noir clones 113 and Pommard will soon follow. This year marks the first harvest at Ayres Vineyard and the first commercial vintage. After an incredible experience as Domaine Drouhin’s Chef du Cave, Brad joins Ayres as the full-time winemaker. Brad pours Ayres wine at the International Pinot Noir Celebration, coming full circle in this journey. Ayres started as and remains a family affair, with Brad as the winemaker and Kathleen as Ayres’ operations manager, while the winery itself lies below the house where Kathleen’s parents live. Ayres Vineyard achieves LIVE and Salmon Safe certification status, reinforcing Ayres’ commitment to sustainable growing practices. What’s next for Ayres? We’re just going to have to ride that wave and see what’s in store…after all, life is a daring adventure or nothing at all.